2015 Document of the Month Archive - Le Comité des Archives de la Louisiane, Inc.
(12/1/15) Pinckney Benton Stewart Pinchback was the 24th Governor of Louisiana and the first African American to serve as governor of any American state. Born in Georgia and raised in Mississippi, he arrived in New Orleans in 1860. During Reconstruction, he was elected to the Louisiana Legislature and later served as Lieutenant Governor and Governor for 36 days from December 1872 to January 1873. Later in life, he earned a law degree and practiced as an attorney. He died in New Orleans 21 December 1921 at the age of 84. His death certificate featured here gives his cause of death as "senile debility" and "interstitial nephritis." This document can be found among the Orleans Parish death certificates (vol. 0, p. 4683) on file at the Louisiana State Archives. (11/1/15) A day of Thanksgiving has been an American tradition for centuries. It has been a federal holiday since 1863, but its date varied over the years. In 1941, the federal government fixed the date of Thanksgiving as the fourth Thursday of November beginning in 1942. 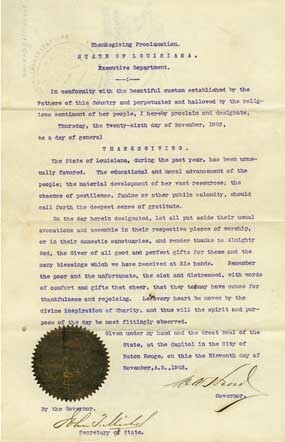 This month's document is Louisiana Governor William W. Heard's proclamation designating November 26, 1903, as a day of general Thanksgiving. The governor encouraged Louisiana citizens to give thanks for their blessings and to comfort the poor, unfortunate, sick, and distressed. It can be found in a collection called Proclamations: 1900-1969 (Accession P1975-33, Box 1). The scanned image is courtesy of Archives staff. (10/1/15) At the first session of the first legislature of the Territory of Orleans, the Black Code of 1806 was enacted to regulate slavery in Louisiana. One of the sections of that law required masters of runaway slaves to make a declaration before the parish judge. This month's document is an example of one of those declaration made two hundred years ago this month. In this document, J.B. Arnandez of Iberville Parish declared that on or about the sixth of September his slave named Francois ran away and had not been seen or heard of since. It is signed the sixth of October 1815. A copy of this document can be found in a microfilm collection called Iberville Parish Civil Records: 1775-1958 (Accession P1986-18), Reel IV 6.1, at the Louisiana State Archives. After microfilming, the originals were returned to the Iberville Parish Clerk of Court in Plaquemine. For a detailed inventory of this collection, see Le Comit� des Archives de la Louisiane's publication, Iberville Parish Records, Volume 3. An index to this book is available on the society's website. 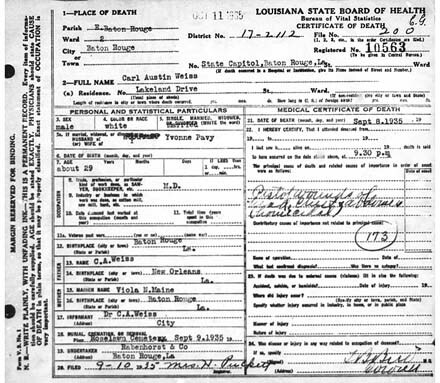 (9/1/15)This month's document is the death certificate of Dr. Carl Austin Weiss, a Baton Rouge physician who confronted and is believed to have shot U.S. Senator and former Louisiana Governor Huey Long in the Capitol building in Baton Rouge on the evening of September 8, 1935. Weiss was then killed by a hail of gunfire from Long's bodyguards. Long died two days later (see September 2013 Document of the Month). Weiss was the son of C.A. Weiss of New Orleans and Viola N. Maine of Baton Rouge. His wife was the former Yvonne Pavy of St. Landry Parish. He was interred in Roselawn Cemetery, but exhumed in 1991 and his remains were never returned. 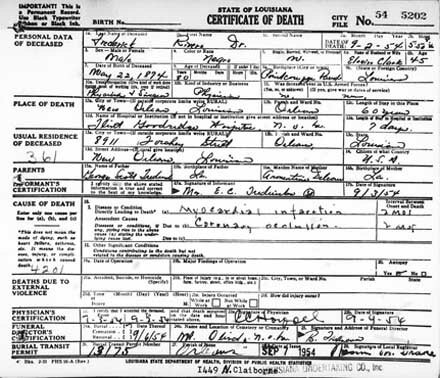 A copy of his death certificate can be found in the Statewide Death Certificates (1935, vol. 25, #10563) on file at the Louisiana State Archives. (8/1/15) The Civil War Battle of Baton Rouge took place on August 5, 1862. The U.S.S. Essex and other Union gunboats bombarded Confederate troops in the city until they withdrew and marched out of Baton Rouge. 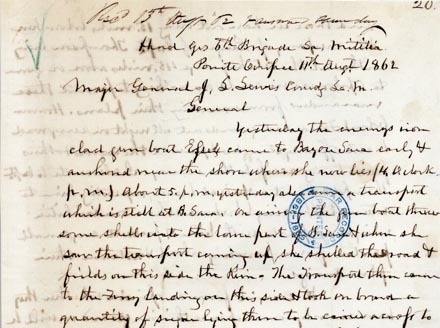 This month's document is a letter dated just six days after the battle. Confederate General Charles Rowley writes to Major General John L. Lewis that the Essex had anchored at Bayou Sara (located just north of Baton Rouge) and began firing. He also informs him that the Union forces had seized a large quantity of sugar from the dock and the railroad depot and arrested two persons. The document can be found in one of the Rebel Archives collections (Accession P2003-25) at the Louisiana State Archives. The collection has not been microfilmed. 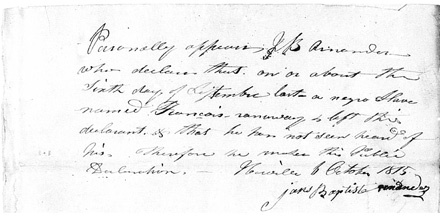 Images of the two-page letter are provided courtesy of the Louisiana State Archives staff. (7/1/15) Lionel Ferbos was a jazz trumpeter. Told as a boy that he could never play a wind instrument because of his asthma, he nevertheless bought a used cornet and took lessons. When he died at the age of 103 in July of 2014, he was the longest-tenured jazz musician in New Orleans. His birth certificate featured here states that he was born 17 July 1911 at his father's residence on Orleans Avenue between Dorgenois and Broad Streets. His parents were Louis Ferbos, a tin smith, and Rosita Richieue (Richeux). 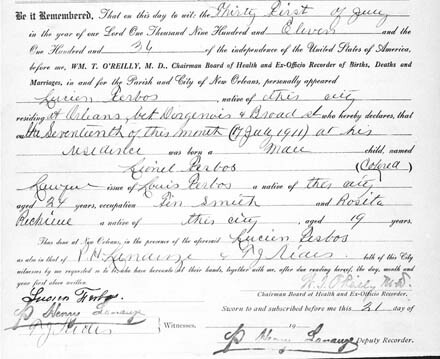 This document can be found among the Orleans Parish birth certificates (vol. 142, p. 589) on file at the Louisiana State Archives. (6/1/15) Published histories of the town of Jackson in East Feliciana Parish claim that it received its name in 1815 after General Andrew Jackson and his troops returning to Tennessee from the Battle of New Orleans camped in the area on the banks of Thompson's Creek. Legend further states that it was originally known as Bear Corners, but that a village was laid out by John Horton and named Buncombe after his home county in North Carolina. 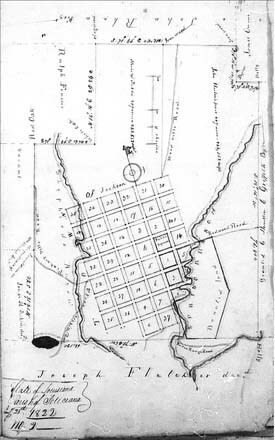 This month's document is an 1822 survey of the Town of Jackson made by William Fulsom at the request of John Horton and Clark Woodruff, representing the heirs of James H. Ficklin. In the accompanying statement, Fulsom certifies that he surveyed a tract containing 414 acres, divided it into two equal parts, and laid out 22 squares of lots in the Town of Jackson. The survey can be found in a collection entitled Louisiana Land Survey Records: 1749-1827 (Accession P1984-605) and commonly called the Trudeau Papers. The original surveys were transferred in 2014 by The Historic New Orleans Collection to the Louisiana State Archives after the former institution held them for 30 years. This survey was copied from reel 3 of the microfilm of those surveys. An outline of the surveys in the collection was published in Le Raconteur (vol. XVI, no. 1, Apr. 1996) and a volunteer is currently preparing a more detailed finding aid for future publication. (5/1/15) Our May 2014 Document of the Month featured the death certificate of Bonnie Parker, half of the infamous bank robbing duo known as Bonnie and Clyde. This month's document features the death certificate of Clyde Chestnut Barrow. On the morning of May 23, 1934, the pair was gunned down by the authorities while traveling down Louisiana Highway 154 in Bienville Parish. Clyde's death certificate indicates he was aged 24 and had last worked as a glass cutter in 1929. His parents were Henry B. Barrow and Cunnie [Cumie] Walker. He was buried in a West Dallas Texas cemetery. A copy of this document can be found in the Statewide Death Certificates (1934, vol. 16, #6207) on file at the Louisiana State Archives. (4/1/15) Born in Baton Rouge in 1891, Lyle Saxon was one of the outstanding Louisiana writers in the 1930s and 1940s. After college, he moved to New Orleans. His pink house in the French Quarter is on Madison Street. He worked on the WPA Federal Writers' Project and wrote a number of books which still remain very important for researchers of early Louisiana data. These include Gumbo Ya-Ya, Fabulous New Orleans, Old Louisiana, Lafitte the Pirate, Father Mississippi, and Children of Strangers. He coordinated some of his works with Robert Tallant and Edward Dreyer. Saxon died in New Orleans at the age of 54. 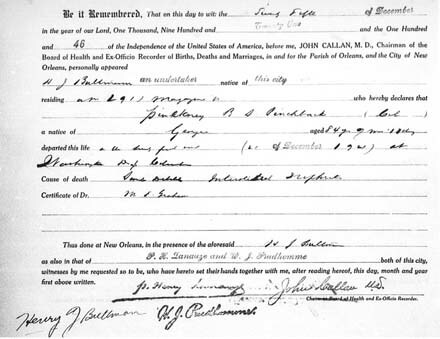 His death certificate shown here (Louisiana State Archives, Orleans Deaths, vol. 222, #2198) indicates his residence was the Saint Charles Hotel. He is buried in Magnolia Cemetery in Baton Rouge. 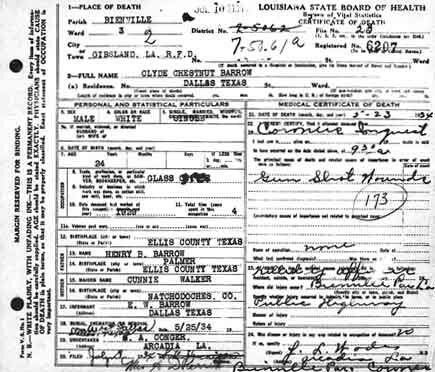 (3/1/15) Although no birth certificate has ever been located for jazz trumpeter and New Orleans native, Louis Armstrong, his 1919 marriage certificate is found in the vital records collection at the Louisiana State Archives. Armstrong's first wife was Daisy Parker, whom he married on the 24th of March 1919. The couple separated in 1923 and Armstrong was married three more times. This marriage record is found in the collection of Orleans Marriages (vol. 42, p. 249). (2/1/15) Rivers Frederick was a distinguished African American physician from Pointe Coupee Parish. Born in 1874, he was the son of George Scott Frederick and Armentine Delcour. After studying in Chicago and New Orleans, he practiced medicine in Pointe Coupee, Honduras, and New Orleans. This month's document is Dr. Frederick's death certificate. He died at the age of 80 on the 2nd of September 1954 at Flint Goodridge Hospital in New Orleans, where he had served as Chief of Surgery. 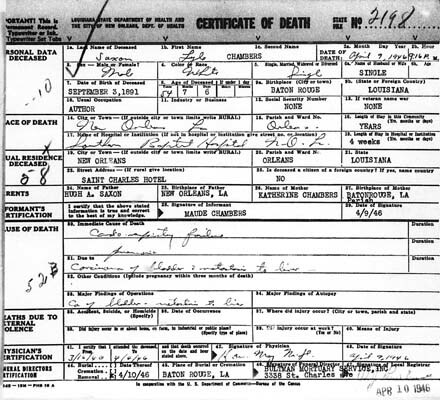 A copy of his death certificate shown here can be found in the Orleans Death Certificates (1954, vol. 0, #5202) on file at the Louisiana State Archives. 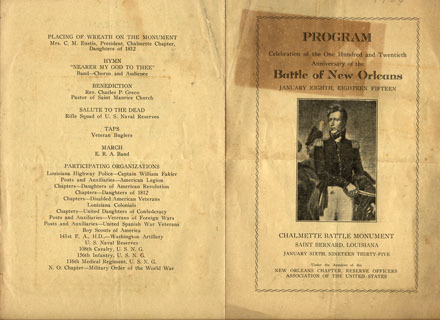 (1/1/15) In commemoration of the 200th anniversary of the Battle of New Orleans, this month's document is a program celebrating the 120th anniversary of the last battle of the War of 1812 between the United States and Great Britain. The event was held at the Chalmette Battle Monument in St. Bernard, on January 6, 1935, under the auspices of the New Orleans Chapter Reserve Officers Association of the United States. The program consisted of speeches, prayers, music, military salutes, and the placing of a wreath on the monument. Numerous organizations participated in the event. This document can be found at the Louisiana State Archives in Box 10 of a collection entitled Jones Louise Levinson Parker Collection: 1899-1995 (Accession N2003-9). The donor was a prominent member of the American Veterans Auxiliary from the 1930s to the 1950s. The scanned image is courtesy of Archives staff.